While wondering the flea market, you spot a possibility so with great anticipation you reach into an old cigar box filed with an assortment of somewhat rough looking pocket knives, just like you have done a hundred times before. Usually it is something of little value that has an inflated price tag on it because it is a “rare” old knife according to the salesman dressed in shorts and a old T-shirt. Nevertheless, unlike that last few times you spot one that looks of better quality even if it is dirty and worn. You carefully open the master blade on a honey bone stockman and scrap of the grit on the tang with your fingernail. Similar to the beeping of a metal detector over a rare buried coin, your heart starts beating faster. The name of Tidioute Pennsylvania on an old pocketknife will raise the eyebrow of any knife collector who even remotely thinks he knows something about the hobby. There were a number of companies and spin off’s that offered quality knives produced in this little town nestled in the hills of Northwest Pennsylvania along the banks of the beautiful Allegheny River. Names like Brown Brothers, Tidioute Cutlery, Union Razor, Baldwin Cutlery, Pennsylvania Cutlery and more came from this somewhat remote area. In fact, some companies had their knives made for them in this town. AC Penn and Hollingsworth both used Tidioute for some of their production. These were of high quality and are prized possessions of those fortunate enough to locate and own one. Of course anyone with any curiosity about the history of KABAR is well aware that it foundations started in this historic little town. In the early 1900′s Union Razor moved North to eventually become the famous KABAR. Amongst collectors, the Union stamps are highly prized. In fact, the company has issued new knives using the old tang stamps. This in it self is a tribute to the historical impact of these earlier companies transitions. You can find more in depth information about that transformation in any number of knife collecting books available in book stores or on-line. The prices that are realized for these antiques have risen considerably in the last few years. I recall that my first ebay transaction was for a near mint Baldwin Tidioute bone handled jack with excellent blades. I was pleased with the transaction and beat out several bidders for a reasonable price in my opinion. The final total was for less than $35. Mind you it wasn’t at the last minute using a sniping program to win over the last bidder by twenty-three cents, but more like the old days when you bid the highest amount you would pay for any item and left it at that. I would suspect that same knife today would venture to bring at least twice that and probably more. This took place only five years ago. In general, knives that originated from this sleepy little town in the early 1900′s consistently bring a high dollar in today’s market. Even specimens in the poorest of condition are eagerly scoop up and highly regarded. 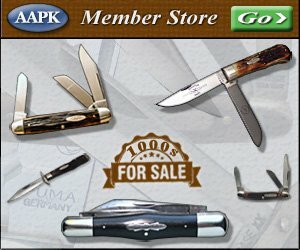 I have seen knives with missing scales, broken blades and very rusted bring $20 to $30. Five years ago I would have called them junkers and kept them for parts at best if at all. I wanted to recant a small adventure that I was on while searching for some of these knives years ago. I have been actively collecting for 30 years and the thrill of the “hunt” is half the fun. We all have our favorite stories about that super find we made, but really one has to be a student of history to properly direct your efforts to be fruitful. Imagine looking for a sunken treasure ship without any knowledge of its history. The find would be nearly impossible in the vast ocean of possibilities. I was delivering goods to Tidioute in the summer of 1987 and started asking the some of the old timers about the manufacturing plant and what they knew about it. I heard more than one story about how the kids would bug the workers at lunchtime and occasional a get slightly damaged knife tossed down to them as a prize. No doubt this encourage more visitors than if they had turned them away, but remember these were simpler times. Most of the parties that I questioned knew exactly where the plant sites were and how many men worked there including their relatives. I was shown bits and pieces of memorabilia brought home from the plant and used around the house. One particular old-timer had a supply of industrial belting that he was given as a youngest by his father who had worked at the Union Cutlery Plant and now used it on the farm. Of course one of my first questions was if they owned any knives, but most often they did not or someone had just purchased them a year or so ago from them. Seems I am always a day late and dollar short. One family in particular supposedly had a nice mint set of pearls that had to be sold to pay for mother’s hospital stay. He said it contained twelve different knives, mint condition and sold them for $100. My heart sank at thought of missing out on such a great find, but someone out there got a real historical treasure in my opinion. I have found that you rarely find an older knife in the area from which it came. I lived in Warren Pa for 37 years and never saw a CASE MFG. Warren Pa. Trust me, I searched hard and heavy and asked anyone and everyone whom I thought might even remotely have a clue as to the whereabouts of this elusive treasure. To this day, I have only ever seen them in books on the subject and never in person. This was the case in Tidioute too. The lone antique storeowner said he had only ever had one razor to sell years ago. You have a better chance of finding one in Tennessee than in Tidioute! Modern day Tidioute continues to be a proud little town and their current claim to fame is the annual Pennsylvania Fishing Tournament held right downtown. The town’s people continue to brag to this day about the rich cutlery history that they have. Sure it is a somewhat remote area and I often wonder what was the attraction for those New York Companies to want to move there? I owned a Brown Bros. straight razor that was marked Tidioute Pa. on one side and Little Valley NY on the other. Others were to follow this same path, but eventually leaving for greener pastures. For the most part all went back to New York State. Union of course went to Olean to become KABAR, Baldwin went to Jamestown and faded out of site and others were consumed by growing companies or simply went out of business. If you have ever have the opportunity to visit this area I suggest you take the time to take in the scenery and imagine what if must have been like nearly one hundred years ago. Uniquely enough, the locals will talk about the companies as if they just went out business a few years ago. Pointing out where the plant stood and how old Uncle Bob brought them home a barlow one year for Christmas. You have to be somewhat of a history buff to truly enjoy this hobby and poking around the charming town of Tidioute Pennsylvania will be a great experience no doubt. Northwest Pennsylvania played a vital role in cutlery history with Town names like, Bradford, Kane, Warren, Eldred and Smithport contributing to that rich history that our fellow collectors enjoy. Remember that having the knife is just a small portion of the total enjoyment of collecting them. This article was published on the front page of the January 2006 issue of Knife World Magazine. Visit Knife World’s website when you get a chance and subscribe to their great publication. Also make sure to leave them a comment for recognizing Mr. Anthony’s great work. We would like to extend a special thanks to Mr. Anthony for allowing us to post this article here.